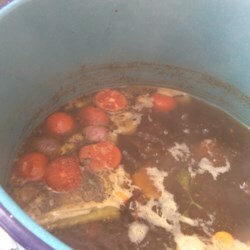 This is definitely the way to make a good beef stock. The only change I made was to roast the bones for a lot longer at a lower temp. I actually roasted for about five hours in order to bring out the flavors. (Just a tip: every time I cut an onion, peel potatoes, carrots or chop celery, I save all the peels, put them in a zip lok bag and throw it in the freezer. In a few months I have a good start on my stock) The vegie and seasoning combos were perfect which created a wonderful stock. I used this recipe to make french onion soup. My hubby Drew and the kids order french onion almost every time we go out for dinner as their appetizer. I never do because of the high salt content, so I was very pleased to be able to make a wonderful stock and at the same time control the amount of sodium. My kiddies say "thanks Wolverine"!